On any weekend, the buzz and cough of gas powered lawn mowers is a common sound in suburbia. Aside from the noise pollution, gas powered lawn mowers spew a stack of greenhouse gases into the atmosphere as their emission controls are nowhere near as sophisticated as today’s cars. A conventional gas powered lawn mower emits on average nearly 90 pounds of carbon dioxide and over 50 pounds of other pollutants into our air every year according to the USA EPA. Emissions aside, there’s all the other environmental nastiness associated with oil exploration, extraction and refining to provide the gas to power these machines. Short of getting rid of your lawn altogether or generally greening lawn care practices, a couple of other options for lightening your lawn mowing environmental impact are electric mowers and reel mowers. Electric mowers are a great option if your house is supplied with green power, otherwise you may just be powering the mower with another filthy fossil fuel – coal. 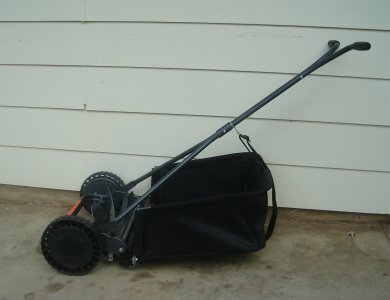 If you’re looking for an even greener option, a manual reel mower could be ideal. After all, why waste money and travel related emissions going to the gym when you can work those muscles and be productive at the same time – in a sense, it’s exercising for the environment! I first used a reel mower was in the late 80’s and that model was from the 60’s. It was certainly quiet, but incredibly heavy and awkward to use. My brief association with the contraption gave me a new found respect for gardeners of yesteryear. But it also probably explains why lawns were so much smaller back then. Times have changed and reel mowers have certainly come a long way. They needed to do deal with the expanses of grass areas around homes these days. Here’s a comparison of old vs. new models in terms of looks. Aside from the slick, modern lines; reel mowers are often far lighter. Some are under 20 pounds for a model similar to the basic old style; a third of the weight of the one I tussled with years ago. I’m told even the heavier modern ones with the extra features are a breeze to push given their design. Manual reel mowers don’t need much in the way of maintenance and unlike reel mowers of old; the blades don’t require sharpening anywhere near as often. I’ve spoken to a couple of people who swear by them, but they recommend that they are really only suited to a flat lawn – a bumpy, sloping back yard will provide probably a little too much of a workout and less than stellar cutting results. A few people have mentioned it takes a few mowing sessions to get the grass “trained” for the mower and that if you have long grass, it’s probably best to whack it down first with a gas powered mower before making the switch to a reel mower for good. Also be prepared to mow a little more often – once the grass gets away from you, it will be a battle with a reel mower. As mentioned, perhaps instead of seeing it as an additional dreaded chore, if you have a regular exercise regimen replace an aspect of it with a regular reel mower workout. Before taking the plunge and forking out the cash for a reel mower, try borrowing or hiring a mower for the day to give it a lawn test and determine if it’s right for you. When choosing a reel mower, it’s also important to ask for expert advice as unlike gas powered mowers, you’ll need to select one suited to your lawn as different models are designed for specific situations and grass types. 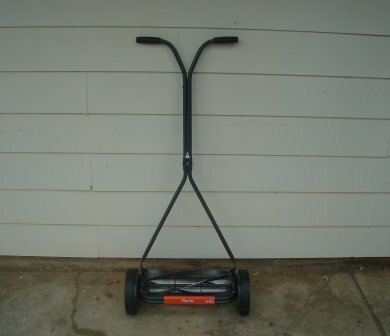 I finally bought a reel mower recently. In Australia, there aren’t all that many choices compared to the USA, so I settled on one that generally received good reviews, a Flymo H40 (Husqvarna). It cost around AUD $150 + $40 for the catcher. The mower + catcher weighs in at under 10kg – approximately 22 pounds. Unlike the original behemoth I used years ago; there is a fair bit of plastic on this one; including the wheels unfortunately. The rear roller is also plastic, as are the adjustment screws. Aside from that, everything else is metal. I wasn’t entirely confident it would do the job. The small patch of grass out the front of my place isn’t really “lawn”. It’s kikuyu and rather patchy, so the surface is quite uneven. Out of the box the mower didn’t do too well, but after I fiddled with the cutter bar adjustment, I was pleasantly surprised at how well it performed. Once I train the grass, it should do even better. Aside from being able to adjust the cutter bar, the H40 offers 4 height adjustments. I didn’t find it all that much different to pushing a normal mower, although I had to run over the same strip several times. In short, I’m a convert. It was so nice to be able to cut the grass without the whole town also being aware of the fact – the quiet operation is a huge plus. 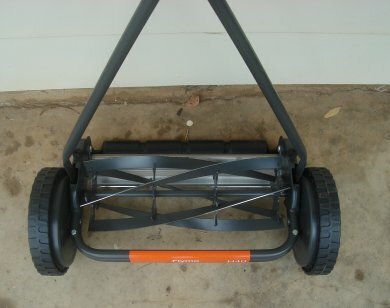 Have you had experience with a modern reel mower? Can you share some advice on model selection and usage? Please add your comments below.